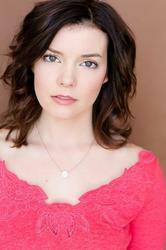 Cherami Leigh has been in the industry for 20 years and has been in over 75 commercials, in addition to her anime work. Among her anime roles are Lucy in "Fairy Tail"; Asuna in "Sword Art Online"; Road in "D. Grayman"; Lizzie in "Black Butler"; Mai in "Ghost Hunt" and Patty in "Soul Eater." She has worked on over 20 video games, including playing DLC Gaige in "Borderlands 2"; Quartermaster Corporal Green in "Call of Duty: WW2"; and Ikrie in "Horizon Zero Dawn's DLC." She voices Sailor Venus in "Sailor Moon"; Tomie in "Mob Psycho 100"; Kudelia in "Gundam: Iron Blooded Orphans"; Claudia Peer in "Gundam: Thunderbolt"; Ilia in "RWBY"; A2 in "Nier Automata" and Makoto in "Persona 5." Recently, it was announced she will be playing Sarada in "Boruto: Naruto The Movie" and multiple characters in "Fire Emblem: Heroes," as well as playing Cagalli in the new release of "Gundam SEED" and Tomie Katana in the French series "Last Man." In addition, she has a lead role in the animated feature "Ribbit," has guest starred on "Doc McStuffins" and plays Peanut Big Top in "The Lalaloopsy Girls." She starred in Shane Dawson's "Not Cool" and the Starz Original Series "The Chair." She has appeared in the Emmy Award-winning "Temple Grandin," as well as in "Friday Night Lights," "The Deep End," "Chase," "Shameless," "Bones," "NCIS: LA" and "Longmire," to name a few. She worked on "Fast Food Nation" with Richard Linklater; "The Hottest State," with Ethan Hawke; "The Mist," with Frank Darabont among others. She also stars in the recently released faith-based drama "Beyond the Farthest Star." She also starred in and produced two seasons of the award-winning web series "Throwing Stones," as well as "CONfessionals." Leigh has a daily affirmation based show, "Love and Light," featured on Anime Unlocked, along with other projects in various stages of production.